As hockey's wandering sons, scattered to the four winds by the lockout, converge back on the NHL, veteran defenseman Lubomir Visnovsky wants to say put in Slovakia. After being traded to the Islanders over the summer, he'd rather stick with his KHL team than come back and get paid millions of dollars more. Bratislava vs. Uniondale; tough call. 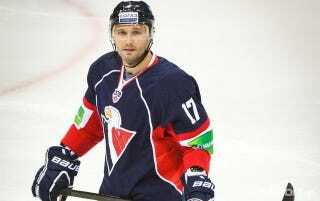 "I have decided to stay and continue my career in the KHL for the remainder of the 2012-13 season. I am thankful to the New York Islanders for being so good to me. My decision not to play in the NHL is due to family and personal reasons. I have made no decisions on next season. My focus now is on HC Slovan Bratislava, and enjoying my family in my home country." This is a lie. Visnovsky was perfectly fine playing in the States as long as it was somewhere nice, like Southern California. When Visnovky was traded from Anaheim to the Islanders in June, he filed a grievance to try to stop it from going through. That appeal was tossed out just before the lockout began, and everyone kind of forgot about it. Not Visnovsky, though, and he's hoping his defection will be lost in the excitement of getting back to hockey. "We have an agreement with the KHL that would preclude Mr. Visnovsky from continuing to play in the KHL once the lockout is officially lifted. I assume that agreement will be respected." There are a lot of issues here, from yet another vet not wanting to play for the Islanders to the tricky dance between the NHL and KHL during a lockout. Just this morning, there's confusion over whether Devils star Ilya Kovalchuk might refuse to return. While the Isles weren't going anywhere with or without Visnovky, the Devils—now minus Zach Parise—could really use their best player in uniform.